For my first post this school year, I want to focus on a goal of mine which is to design a class that focuses on learning, and not issuing grades. Sometimes students may score low and yet they have a good understanding of the skills that were taught. Oftentimes a high acheiving student will only do enough to get the A, but not go beyond and learn more. In an effort to focus on learning not the grade, I restructured my grading this year to focus on the student’s learning. I am not allowed to completely throw out grades, but by having students grade themselves on their learning, the focus has changed a lot. To understand a little more of my thought process, let me explain the rules of my class. 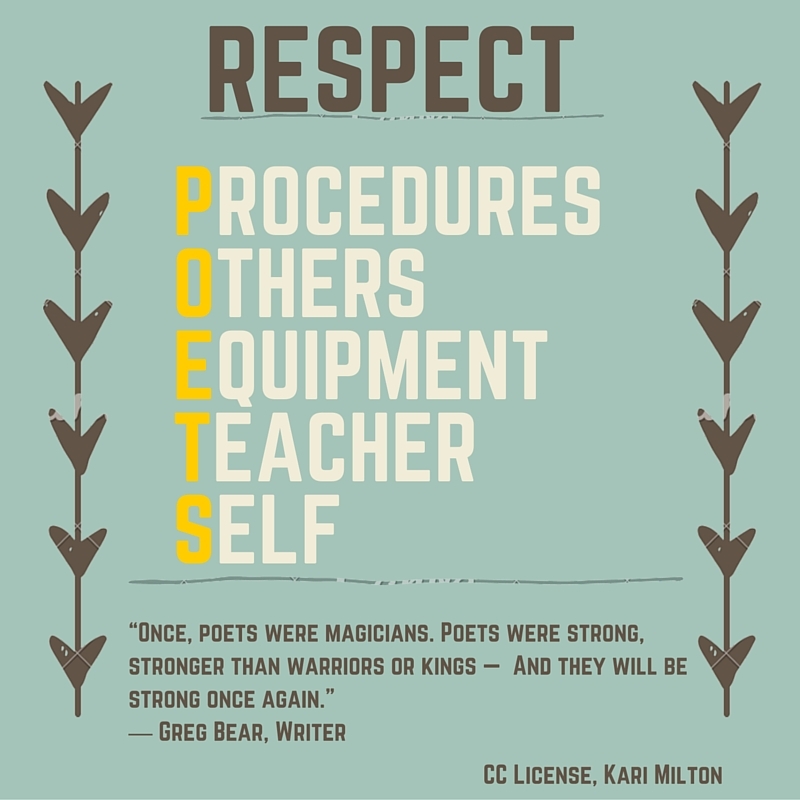 It’s based on Respect of POETS. This is an acronym that I made up. Though I made this acronym last year, I was not able to really impress upon my students the importance of the final S for Self. We quickly went over it at the beginning of the year that respecting yourself was always putting forward your best work. But that was it. This year, respect for self has become as important as all of the others listed, arguably more than some. Students score themselves on whether they put forth their best work on a rubric that I have designed for each project they undertake. Since nearly all assignments in my class are projects, I do not want to question someone’s best work. At the California Teacher’s summit in July, Yvette Nicole Brown told the story of a poster she created when she was in 1st grade. Her family didn’t have a lot of money, so she taped 4 pieces of paper together, and carefully made bubble letters with markers for her poster. She was very proud of the work she put in and couldn’t wait to show her teacher her poster. But when her teacher saw it, the teacher held it up as an example of a lousy project, which greatly embarrassed and squashed the pride she had in her work. In an effort not to be that teacher that puts a judgement on a students’ effort, I have recently developed a system using self grading and rubrics. 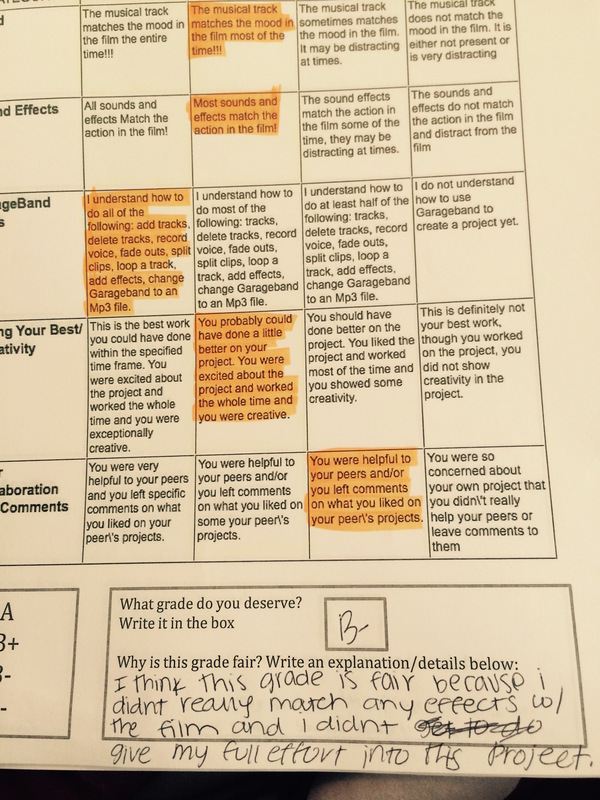 Students self score themselves and write what grade they believe they deserve on a project. Then I give them the grade they asked for. I still give feedback on their work. 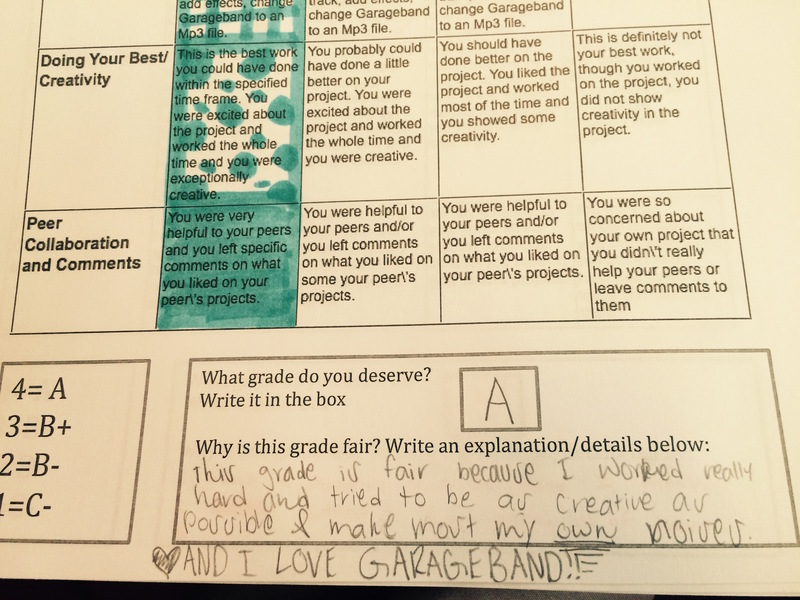 I let them know what I liked and how it could be improved, but they earn the grade that they wrote on the paper. Of course my students are not used to this. Out of 76 students in the 2 classes that I began this system on, 2 students scores were not close to what I would have given them on the assessment. This opened a conversation with them where they learned how better to use the rubric to score themselves. Students have now turned 2 assignments this way using this self scoring rubric based system. Here are some of the results of the last project. Both of these projects self scored an A-, though this student chose more areas in the 3 column. Since I allow students to improve their work to encourage the Growth mindset, this discrepancy is minor as I see the best person to decide on their end score is the learner. This student was very proud of her work as evidenced in her comments she left at the bottom of her work. This was a student I had last year that even though he had a lot of great skills, the grade he earned at the end of the year was below his skill level. 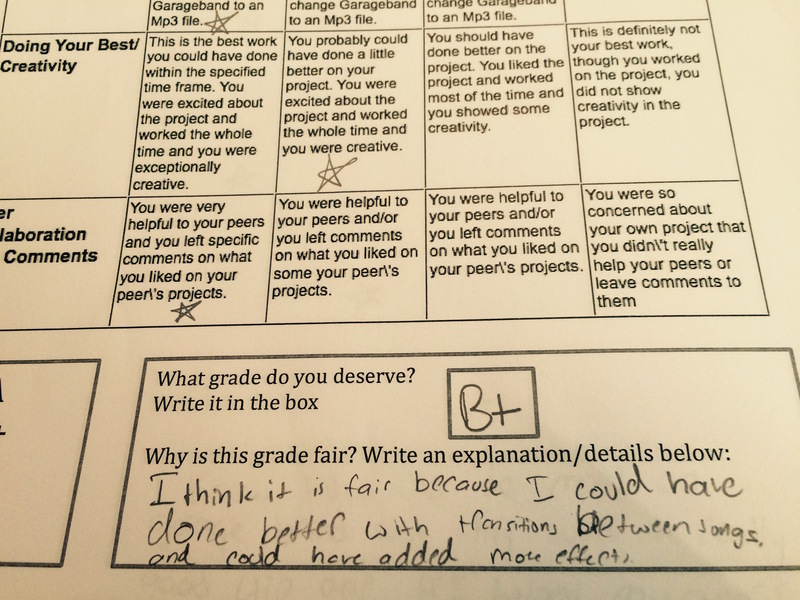 By allowing him to self grade on the given rubric, I believe it has set him up for success. Some discrepancy will exist. Both of the students chose and A- for their final score, even though this student gave themselves more 3s than the previous student. This discrepancy is minor, especially since I give students the opportunity to improve their projects if they would like to earn more credit as I try to instill the growth mindset in my students. NOTE: You will see that my classroom is not paperless. Though I love all things digital, I have not found a platform that I like yet that has students self score into a rubric. 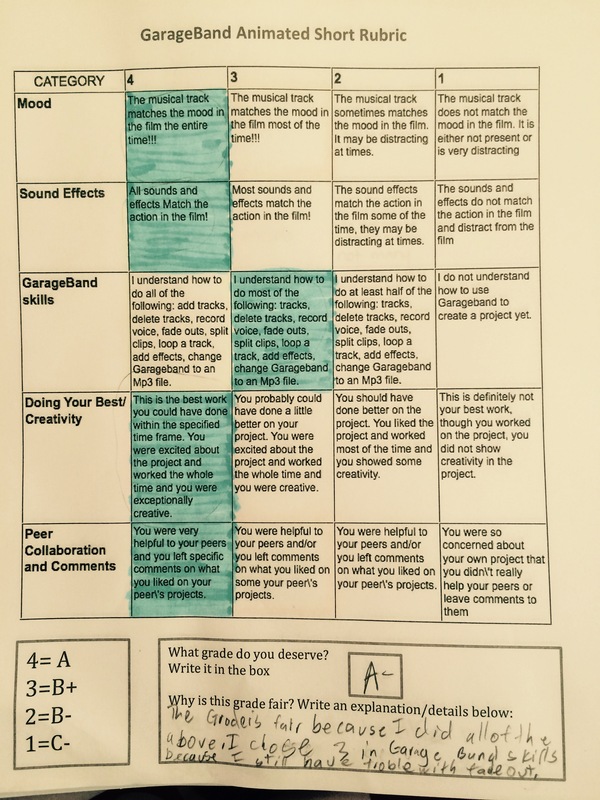 I would like a system which looks like a rubric and students could press the box to highlight each category. Then the computer would look at the data and suggest a range of holistic scores for the student to choose from then explain why this score reflects their work. Finally, it would be delivered neatly into a class spreadsheet of sorts (something like Google Forms, but specifically for Rubric makers). If I can’t find what I am looking for, I think this will be a summer project, I will create it….